Arbitration is a flexible and consensual means of resolving commercial disputes through a binding and enforceable process. Impartial decision makers – also known as “arbitrators”, are either selected by the disputing parties, or through a mechanism agreed on by these parties to form an arbitral tribunal. The purpose of this arbitral tribunal is to collectively bring about a binding decision which effectively resolves the dispute in question. An arbitration is conducted in accordance with the terms of the parties’ arbitration agreement. This is usually contained in commercial contracts, stand-alone agreements, and applicable investment treaties. Its flexible, confidential and impartial nature, as well as the ‘party-autonomy’ factor makes arbitration the most common form of alternative dispute resolution mechanisms. On this basis, the parties voluntarily agree to resolve their disputes through arbitration and are then bound by the decision of the arbitrator(s). These decisions termed awards are enforceable in over 150 countries that are signatories to the New York Convention on the Recognition and Enforcement of Foreign Arbitral Awards (the New York Convention). Arbitration may be institutional or ad hoc. Parties to an arbitration in the Lagos Court of Arbitration (LCA) are free to agree on whether to use the LCA Rules, other arbitral rules or no rules whatsoever. Institutional arbitrations are administered by an arbitration institution, such as the LCA. Typically, proceedings are conducted under the arbitration rules which have been drafted by the chosen institution and selected by the parties. The 2018 LCA Arbitration Rules set out the framework of the procedure, from the submission of the notice of arbitration to the issuance of the award. Ad hoc arbitrations are not organised under the supervision of an institution. Here, parties agree to arbitrate without designating any institution to administer the arbitration and may choose to either adopt a ready-made set of arbitration rules (such as the UNCITRAL Arbitration Rules), or draw up a set of rules specifically for resolving the disputes between them. Overwhelmingly, institutional arbitration is more popular than ad hoc arbitration. One of the advantages of arbitration over other ADR mechanisms is the finality of its awards. Once an award is given by an arbitral tribunal, this award is deemed binding and enforceable under the New York Convention; a Convention signed by over 150 countries. Each of the parties to this Convention undertook to recognise and enforce arbitral awards made in other signatory countries and are bound by this undertaking. This results in arbitral awards enjoying much simpler international recognition than court judgements. International arbitration conventions and national laws give parties complete autonomy to agree upon the substantive laws and procedures applicable to their arbitration. One of the principal reasons for granting parties procedural flexibility, is to enable them to dispense with technical formalities of national court proceedings and to tailor the procedures to their particular disputes. Unlike proceedings in most national courts, arbitration hearings are conducted in private. These hearings are almost always closed to the press and public; parties’ submissions and tribunal awards often remain confidential. One of the most valuable attributes of arbitration is providing parties with a neutral forum, detached from the parties and their respective home-state government, thus avoiding the so-called “homeboy” advantage. Thus, parties are free to choose a neutral arbitral venue when drafting their arbitration clause/agreement. Further, once a dispute has arisen, parties may appoint independent arbitrator(s) of their choice to form a neutral tribunal or the appointment is made on their behalf. Although arbitration carries with it legal and arbitrator fees as well as administrative costs, generally, the process is usually less expensive than litigation. It typically consumes significantly less time than a trial does, as the time frame of arbitration is determined by the parties, their submissions, the nature of the dispute and the tribunal, not the court. Arbitration is also cost effective because the arbitrators’ decision is almost always final and binding. Of course, should the arbitrator exceed his or her authority or jurisdiction, either party may file an application to vacate the award in a court of competent jurisdiction. Such applications can only be filed based limited grounds for setting aside arbitral awards. Arbitration awards are usually final and binding. Appeals are usually impermissible from an arbitral tribunal’s award in International arbitration procedures. There are instances where an award can be set aside i.e. due to procedural anomalies such as an unfair procedures or the arbitrators’ lack of independence, however, these instances seldom occur. In most legal traditions, judges are generalists, often without specialisation in complex matters, and are randomly assigned cases regardless of their experience. Arbitration, on the other hand, permits parties to choose experts in a specialised field to hear a case and clearly understand the complexities and technical issues involved in that specific disputes. The seat or legal place of arbitration shall be [City and/or Country]. The governing law of the contract [is/shall be] the substantive law of [ ]. Parties may also freely adopt the LCA Standard Arbitration Submission Agreement for Existing Disputes. 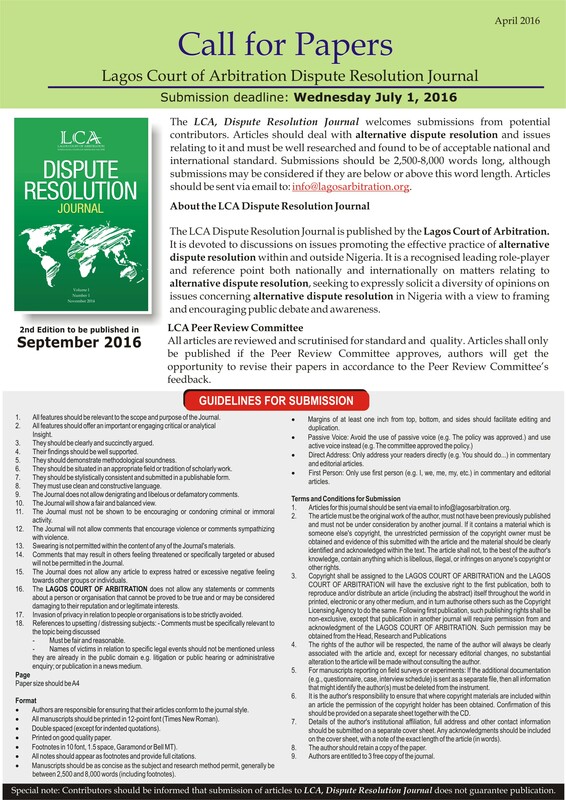 Please contact info@lca.org.ng for the Submission Agreement. The Lagos Arbitration Law 2009, incorporates the UNCITRAL Model Law (1985) with the 2006 amendments. The Law regulates the use and practice of arbitration in Lagos State except where parties have chosen to adjudicate their dispute under any other arbitration law. Approved by the Council of the IBA on 22 May 2004, the IBA Guidelines on Conflicts of Interest seek to define a framework to assure the impartiality of arbitration in the international arena. The Guidelines contain a series of seven general standards of independence and disclosure to govern the selection, appointment, and continuing role of an arbitrator. They serve as a resource to parties, institutions and arbitrators to help identify situations where conflicts of interest of an arbitrator may arise and disclosure of his or her circumstances should be made. The IBA Guidelines for Drafting International Arbitration Clauses were approved by the IBA Council in October 2010. The IBA Guidelines for Drafting International Arbitration Clauses are designed to help achieve effective arbitration clauses which unambiguously embody the parties’ willingness to have their dispute(s) resolved by arbitration, as well as aspects of the process which they wish to adopt. They provide both a framework and detailed provisions for drafters of international arbitration clauses, and are designed to ensure that parties know what the essential elements of an effective clause are and what features of the process are open to them to determine in advance. On 29 May 2010, the IBA adopted new Rules on the Taking of Evidence in International Arbitration, superseding those of 1999. The Rules are a resource to parties and to arbitrators to provide an efficient, economical and fair process for the taking of evidence in international arbitration. The Rules provide mechanisms for the presentation of documents, witnesses of fact and expert witnesses, inspections, as well as the conduct of evidentiary hearings. They are designed to be used in conjunction with, and adopted together with, institutional, ad hoc or other rules or procedures governing international arbitrations. The IBA Rules of Evidence reflect procedures in use in many different legal systems, and they may be particularly useful when parties come from different legal cultures. The IBA Arbitration Committee and its Task Force on Counsel Conduct have produced guidelines for party representation and counsel conduct in international arbitration. The IBA Guidelines on Party Representation in International Arbitration are inspired by the principle that party representatives should act with integrity and honesty and should not engage in activities designed to produce unnecessary delay or expense, including tactics aimed at obstructing the arbitration proceedings.